This entry was posted on July 6, 2015 by admin. 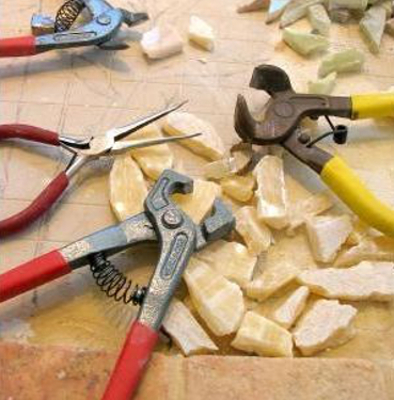 Making mosaic means also being able to use a set of tools, each with a particular purpose. Here is a selection of the best tools on the international market for hobby and professional mosaic artists. This is the best glass mosaic tile cutter on the market, easy to use and precise. A must have for every professional mosaic artist. You can find in our store also the replacement wheels. Here is a generic copy of the much loved Leponitt Nipper. It is lighter weight and has steel blades that can be replaced with the Leponitt replacement wheels or the generic ones. If you are a hobbyist, this nipper can be a good start point at a moderate price. The traditional hardie is a steel tool which on one side is like a chisel and on the other side has a wedge. It is very useful for breaking stone, marble, smalti and glass tesserae. It should be fixed on a wooden stand or something similar to be used. The Blue Runner can be used only for stained glass and mirror sheets. Once the glass is scored this tool helps shaping stained glass into straight edged pieces. Not recommended for use on mosaic tile. If you love your eyes then please wear safety glasses while cutting. Ours can even be worn over reading glasses and are clear top, bottom and sides as well as the lenses to let the light in. Removes excess glue from your finished mosaic. Work with glue more precisely with this handy syringe. Perfect tool for picking up those tiny pieces, especially when they are covered in glue! Handy for spreading grout over a mosaic without getting your hands dirty. Can be washed and reused as often as needed. If grout dries on the rubber simply bend to crumble and remove. Wipe or soak with white vinegar to remove any grout residue.